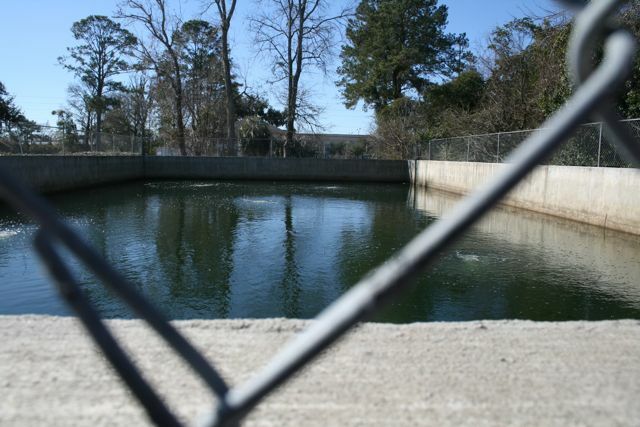 Check out this water feature at Abercorn Common! Don't you think a solar boat would look good there? Our route doesn't take us near many shopping centers. 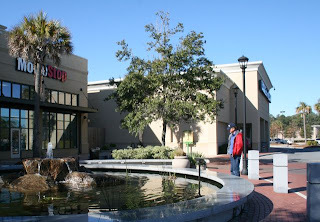 But when we docked this past Friday afternoon at Isle of Hope (about 10 miles from downtown Savannah), we made special plans to visit a strip mall. It's not that we were dying to shop at Books- a-Million or grab a burger at Mickey D's. We just had to check out "the first retail center in the United States to become LEED-certified." Part of the reason for our curiosity: About two weeks ago, President Obama visited Penn State University (our home base). His visit focused media attention on a PSU-led project involving energy-efficient buildings--a $122 million DOE grant to turn a portion of Philadelphia's Navy Yard into an "Energy Innovation Hub." With the PSU project in mind, we wondered whether Savannah, a sizable city, is doing much sustainable building. And hey! Just a few miles from the dock, we learned, was LEED-certified Abercorn Common. Road trip! LEED, as you probably know, stands for "Leadership in Energy and Environmental Design." It's a set of guidelines developed by the U.S. Green Building Council. To win LEED certification the building or complex must (among other things) conserve water, energy, and other resources. The shopping center at the Abercorn Common site was first built in the late 1960s--an era when strip malls were still a novelty, but proliferating rapidly throughout the United States. 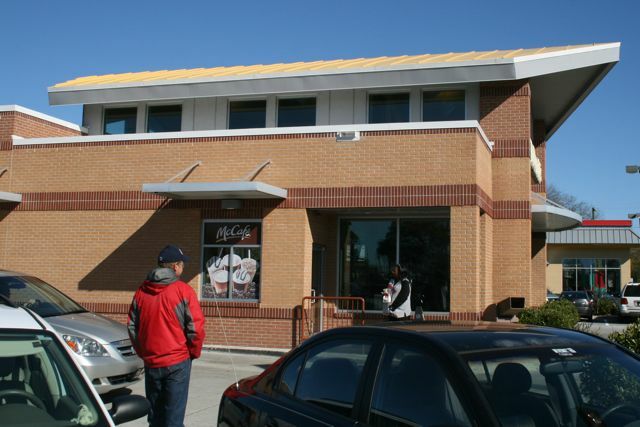 No golden arches, but it does have a golden roof. Tenants came, tenants went. Fast forward. In 2004, Melaver Mouchet, the company that owned the property wanted to enlarge and renovate it. Having already applied LEED principles to a downtown office building, they decided to do the same thing with their mall. When this place re-opened, in 2006, it got a little media rush as "the prototype for sustainable retail stores of the future." It even includes the WORLD's first LEED certified McDonalds. From the road, Abercorn Common today looks like any mall on any miracle mile. OK, I take that back. It's attractively landscaped, it has fountains, and the buildings use old brick to good effect. But it's not like you'd drive by, and from the road you'd instantly say, "Wow, this is different." When you get out of your car and walk around, though, it's like visiting a mall and a museum all in one. Signs and displays explain the special green-building features. A few examples: The roof is painted white, to reflect the sun and reduce the need for air conditioning. Builders used low volatile organic paints and sealers to reduce greenhouse gas emissions during the renovation. They installed water-conserving bathroom fixtures in the shops--low-flow toilets and sink faucets. And where many renovation projects mean sending loads of wood, bricks, and sheet rock to a landfill, in this renovation 85% of the materials from the original center were recycled rather than demolished. We pushed through some bushes and tromped out back, behind the stores, to check out the recycling centers, and . . . the cistern. When it rains, a system of jumbo gutters collects water from the mall roof and funnels it to a large cistern--half a million gallons. The mall uses the rainwater (rather than drinking water, which is better used for drinking!) to irrigate the abundant plantings. 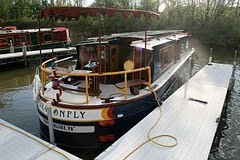 collect rainwater from the boat roof? We liked the acre of "porous pavement" incorporated into the parking lot, which helps reduce flooding. And the parking lot has lots of "islands" with shade trees, which help to reduce, a little, the heat reflected from hot black asphalt. Parking spaces at the front of the parking lot are reserved for hybrid vehicles. Of course it's going to take a LOT of fuel efficient vehicles to make a difference in overall fossil fuel consumption. This mall is located at an intersection that handles 100,000 vehicles a day. I can't help but think, those reflective rooftops and the extra-good insulation and the efficient light bulbs account for a tiny drop in the energy conservation bucket compared to the fossil fuel you'd save if 100,000 cars a day got better gas mileage (or if 100,000 shoppers could bike, walk, or ride public transportation to their destinations). We forgot to check whether the mall has bike racks for shoppers. Apparently there ARE bike storage facilities and showers for employees. building green can add about 10 percent to construction costs. But tenants subsequently enjoy about a 35% savings in energy costs. Abercorn Common has a nearly 100 percent occupancy rate despite the economic downturn--maybe that's why. Abercorn was a pioneering project 5 years ago. Now many retailers--a bunch of names you'd recognize from any strip mall on any miracle mile anywhere--are building stores with the goal of meeting LEED certification. Let's see: Good for the environment . . . AND saves money. You don't need an MBA to analyze THAT scenario.